From Southern Indiana, to Louisville, to Heart of Kentucky, The Best Move You Can Make. Schuler Bauer Real Estate Services is a full-service residential and commercial broker serving Southern Indiana, Louisville and the Heart of Kentucky (Elizabethtown, Bardstown and surrounding areas). Schuler Bauer is the largest independent real estate firm in the Louisville metro area and the top company in Southern Indiana. With a full-time support staff promoting consistency and quality of service, we combine old-fashioned, personal service with the latest technology to give our clients the treatment and the edge they deserve. Let our professional team of expert Southern Indiana Commercial Realtors give you the help you need. From lenders to home inspectors to insurance options, our Community Choice partners give you all the info you need. Get Started Now! Schuler Bauer Real Estate Services leads the Southern Indiana, Louisville and Heart of Kentucky real estate markets by embracing the free flow of information through the Realtor® to the customer. 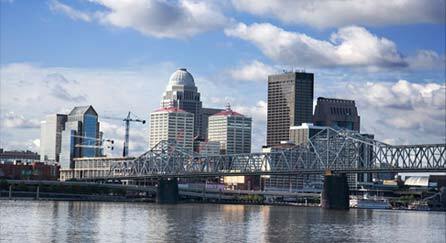 As the largest independent real estate firm in Southern Indiana and the Greater Louisville area, Schuler Bauer has built a reputation of integrity and professionalism within the community. Schuler Bauer’s local focus and ownership set it apart in a crowded field. Whether you are a first-time home buyer looking for a $100,000 home in central Kentucky or you're in the market for a million dollar estate in Floyds Knobs, our team of professional agents will treat you with respect and honesty that you deserve. As members of the Southern Indiana MLS (SIRA), Greater Louisville MLS (GLAR), and Heart of Kentucky MLS (HKAR), we have access to all of the active real estate listings on the market from Corydon to Elizabethtown and everywhere in between. No matter the style of home you desire or the budget you have available, we have access to virtually every listing for sale in Southern Indiana, Louisville and beyond. Schuler Bauer is the dominant sales force in Southern Indiana Real Estate, dwarfing its nearest competitor by a 3:1 ratio. From New Albany to Clarksville to Jeffersonville to Corydon, our Southern Indiana real estate community guide makes it easy for you to search homes by area and type. All listings are updated daily from the Southern Indiana MLS (SIRA) and include large photos, detailed school information, info on nearby listings, and even a summary of each listing's price change history.